Joyce-Elena Ní Ghiobúin graduated from Trinity College, University of Dublin, with an MPhil in Reconciliation Studies in 2012. 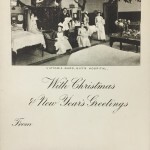 Since then she has been researching denominational aspects of British-Irish nursing history in the late 19th and 20th centuries and may be contacted at nighiobj@tcd.ie. That anticipation crossed my mind when first confronted with a selection of files at the King’s College London Archives. I was amazed by Dr Saunders’ eye for detail and her foresight in creating records of so many encounters – she must have had future generations in mind! The documents I consulted were filed thematically, thereby often dating back to a specific period in her life. Yet two core interests spanned the years from her first involvement in hospice care in the late 1940s up until her death in 2005: her restless initiative in expanding her own medical awareness, and a preoccupation with the spiritual aspect in care provision. Figure 1. Cartoon, St Thomas’s Gazette, vol. 72 no.4 (1974), 14. The material at King’s College London Archives provides a trail of primary documents beginning from the point at which Cicely Saunders decided to follow that advice. Among the papers placed in my hands as a researcher were the drafts of her M.D. thesis examining pain control among terminal cancer patients, which was a novel direction for research in the mid-1950’s as most doctors focused on curative care problems. The material includes her handwritten calculations and brainstorming exercises, interspersed with letters from her supervisor on how she might rearrange her thesis chapters to best effect. Two of Saunders’ letters are addressed to a professor of veterinary science who had developed tranquilizers for rhinoceros in Uganda using a mixture of morphine derivatives: she wrote to him in 1964 for further insight into analgesics and their tested effects. Still more files contain cuttings from medical journals on the most up-to-date pain control debates [Fig. 1]. 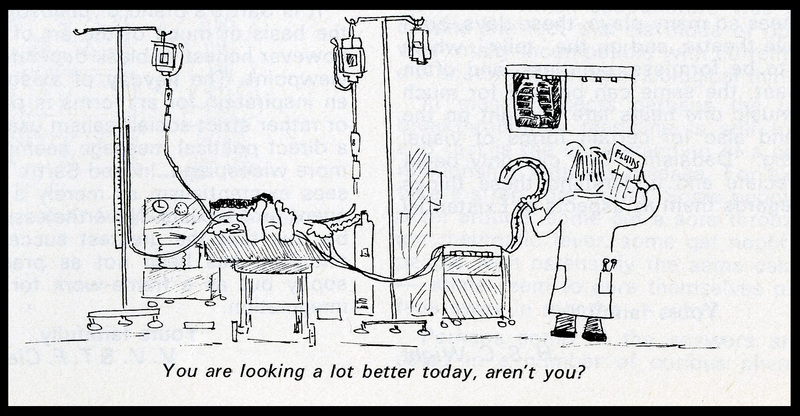 Such early investigative thrusts – St Christopher’s would not open until 1967 – attest to Saunders’ resolve to base future hospice work on the best medical and ethical practice. She later affirmed that St Christopher’s was neither the first nor “the model” hospice, but an example of how up-to-date research might be conducted alongside intuitive patient attention in the same care-giving space. The collection also offers a chance to read through the layers of her accumulative insight into “total pain”, as she had called it by 1964, an understanding gained through hours of listening closely to hundreds of patients she interviewed while working at St Joseph’s Hospice. Through them she came to comprehend fully the patient’s place in a larger community and the need for a social and emotional aspect of care, such as in extending bereavement support to patients’ families. This not only symbolically tied the mind with the heart, but drew further on her available knowledge of “creative sensitivity” to the needs of everyone in the hospice community. 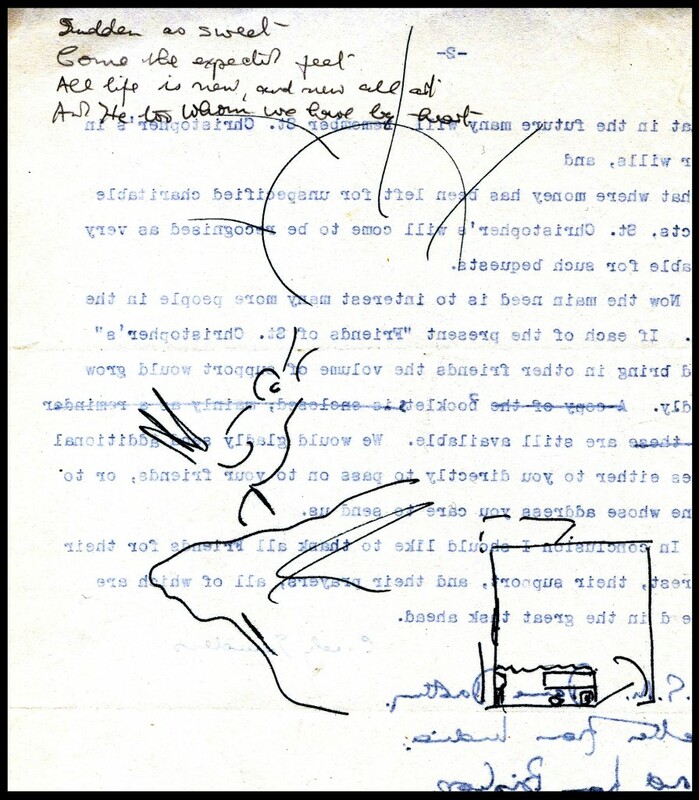 Among Saunders’ papers are her collected poems, quotations and articles which substantiate this intuitive, artistic direction [Fig. 2, above]. They include lines written by patients in Britain and the U.S., some quotations translated “from the Chinese” and a few English poems from the 8th century A.D., including one dated c 780 called No Man is in the Fields. This latter poem found its way into her 1983 anthology for the bereaved and suffering, Beyond all Pain. What is especially interesting in Saunders’ 1960s poetry collections is her preference for Christian poetry – including, for example, an amusing song from 5-year-old “Lucy” beginning with the line, “When the Baby was borned, Joseph said to Mary …” Her 1983 publication replaces most of these poems with choices that are more wide-ranging both denominationally and geographically, in itself reflective of Saunders’ personal journey in later years to reach beyond her “home” in the Anglican Evangelical tradition. Nevertheless, the thematic framework of Beyond all Pain’s chapters (e.g. ‘Suffering’, ‘Dying’ and lastly ‘Resurrection’) preserves a Judeo-Christian framework of meaning. For Saunders, “spirituality” was “much wider than religious practice. It is the search for meaning, the look at one’s own most important values, the feeling of looking beyond yourself and of somehow belonging to something more than you are”. All researchers looking back on Saunders’ collections, regardless of their individual evaluation of the importance of the spiritual, face the fact that nearly a third of her publications, if not more, were concerned with the dynamics of “spirituality” in end-of-life care. Figure 4. 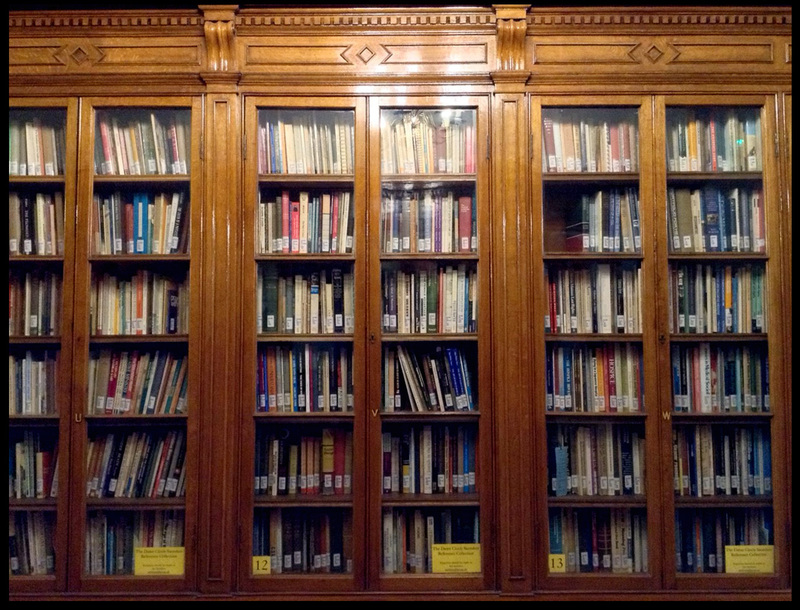 The library of Dame Cicely Saunders, King’s Building. Access is available upon request through King’s College London Archives. 2017 marks the fiftieth anniversary of the establishment of St Christopher’s Hospice. This commemorative year, together with the research it promotes, is itself a season of transition, appreciation and learning, like that of Saunders’ in the years leading up to the establishment of St Christopher’s in 1967. As she herself remarked on Desert Island Discs in 1994, the modern hospice is not about “bricks and mortar” but rather about the attitudes, skills and ideas that are “spreading widely” because of St Christopher’s Hospice, enabling many patients to count their last days as their fullest. 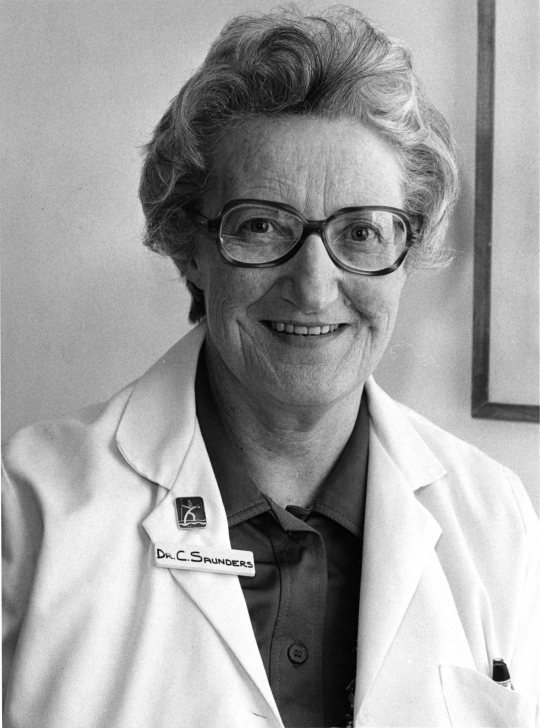 Her dedication in promoting pain control and personal concern helped to forge a comprehensive approach to medical care, a lifetime’s actualisation that is thankfully well-documented and well-looked-after. For the researcher of Hospice History as much as for the patient in its care, it might well be said, to quote a favourite anthology of Saunders’, “All in the end is harvest”. David Clark, “Making Sense of Cicely Saunders”. International Symposium on Cicely Saunders, Hospital San Juan de Dios, Pamplona, October 17th 2015. David Tasma, quoted in Shirley du Boulay, Cicely Saunders: The Founder of the Modern Hospice Movement (London: Hodder and Stoughton, 1987), 56. Saunders, Watch with Me (Sheffield: Mortal Press, 2003), 41. Norman Barrett, quoted in du Boulay, Cicely Saunders, 63. Saunders in conversation. 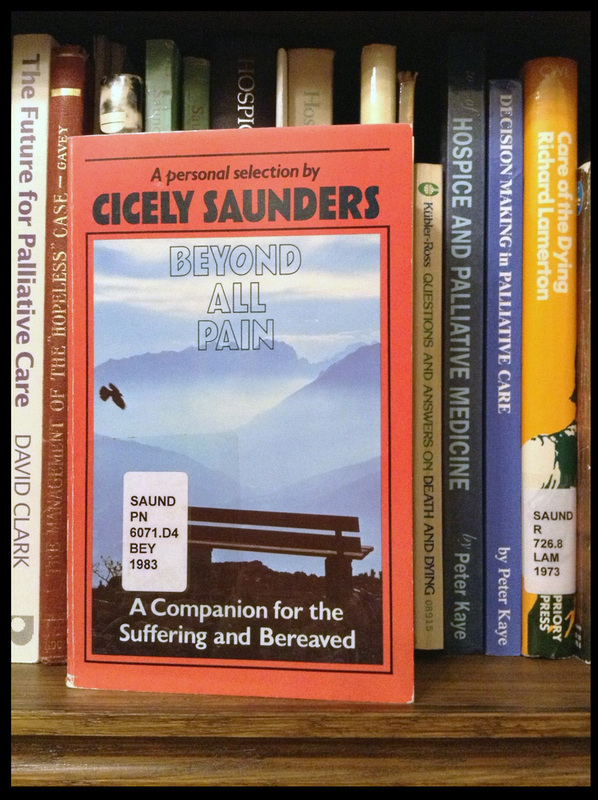 “Elements and Models of Palliative Care: A Conversation with Dr Cicely Saunders’’, Youtube. [Accessed 15 May 2017]. This line is from Edith Sitwell’s poem Eurydice and was adopted as the title of an anthology by the same name edited by Agnes Whitaker. All in the End is Harvest: An Anthology for those who Grieve (London: Darton, Longman & Todd, 1984) was a valued volume in Dr Saunders’ personal collection. The Foyle Special Collections Library holds King’s College London’s and its affiliated institutions’ historical medical collections and we wanted to let Library customers, researchers and colleagues know about recent work we have been doing with them. Promotion and access to the collections is important, as they reflect King’s long and continuing history of medical teaching and research. 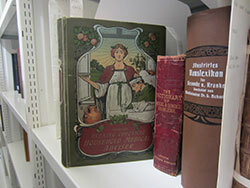 Over the past year we have been participating in the UK Medical Heritage Library project. 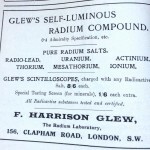 This Jisc funded project, administered by the Wellcome Trust, has seen 15 million pages from UK institutions’ 19th and early 20th century medical collections digitised for research purposes. 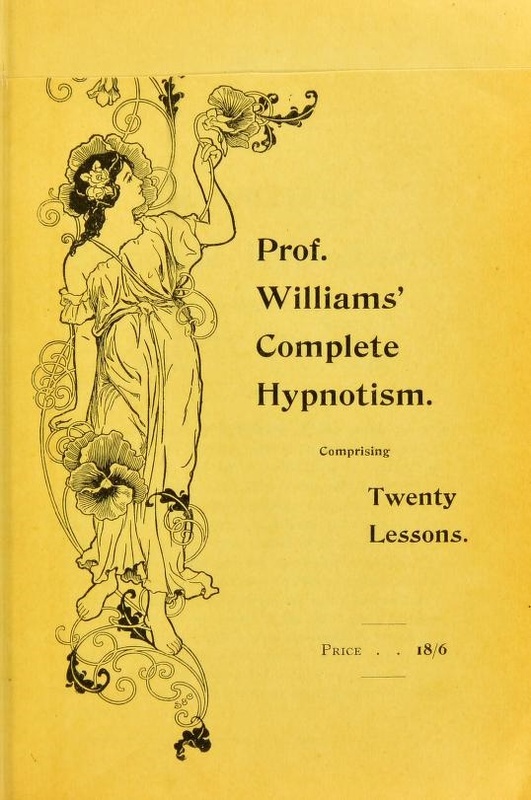 Our work has involved identifying, packing and sending 2,000 items to the Wellcome Trust to be digitised and made freely available online, as part of the project. The logistics of the project have involved the employment of a Project Officer; ensuring the safe return and handling of rare items; and liaison with the Internet Archive who have undertaken the scanning of the books. 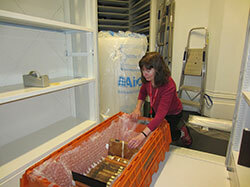 Now all the books have been safely checked back in, (we’ve checked very carefully!) we have just made the records accessible through the Library catalogue. If you see a catalogue record like this one to the Household medical adviser it should provide a link directly to the digitised record…if it doesn’t, please let me know! With special thanks to Victoria Parkinson (Metadata Coordinator) and Liz Serebriakoff (Service Development Coordinator) for their help with the technical aspects of this project. As well as putting the finishing touches to the UKMHL project, we have also been identifying Special Collections material that is currently in other Library Services locations. 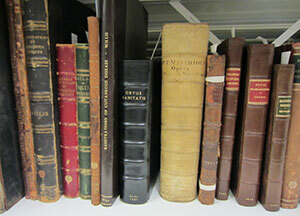 Generally, we are especially interested in pre-1900 books, items with significant provenances, those that are fragile, or those connected with the history of King’s. While the image of librarians rooting around in stores for rare books has long been a staple in the library world, we do use the library management system and spreadsheet lists to identify material which needs to go into Special Collections. We are also happy to hear from colleagues who spot books that they think should be in Special Collections, or who receive information from a library customer to such effect, as has recently happened. Among the material which the Foyle Special Collections Library has recently acquired from the WEC Store are several items with very interesting provenances. One of the most distinguished owners of these books is the surgeon Joseph Lister (1827-1912). Lister established the scientific basis of antiseptic surgery, and for clinical medicine in general. The book which stands out is a copy of the 1898 edition of Sir Patrick Manson’s Tropical diseases, which bears the author’s inscription as well as Lister’s bookplate. Sir Patrick Manson (1844-1922) was responsible for discovering the causation of malaria, and for founding the London School of Tropical Medicine. Another book, Sir Thomas Lauder Brunton’s Pharmacology and therapeutics (1880) bears the author’s inscription. Sir Thomas Lauder Brunton (1844-1916) was a distinguished physiologist and pharmacologist who undertook pioneering research on the action of enzymes in the digestive system. He was also the first medical scientist to establish the connection between high blood pressure and heart disease. Another item with an interesting provenance is Annales mèdico-psychologiques, which has the bookplate of the psychiatrist George Henry Savage (1842-1921), one of Virginia Woolf’s psychiatrists. The psychiatrist in her novel, Mrs Dalloway was modelled on him. This is a very rare edition of a very popular work, which was first published in 1747, and which ran to many editions. This book was written at a time when many families self-medicated from choice or necessity. Its prescriptions avoid complicated pharmacology. Cold water bathing (a favourite of the 18th century), food (a diet of turnips for a month as a cure for scurvy, the application of toasted cheese to cuts) and exercises (rubbing the head for quarter of an hour as a cure for headache) feature heavily. The book is informed throughout by a strong scepticism about orthodox medicine and medicines, but its underlying theoretical basis is humoural and Hippocratic. We also recently received some items which were the gift of Rachel Paton, daughter of Dr Alex Paton, formerly of St Thomas’s Medical School, who died in 2015. With many thanks to Alan Fricker (Head of NHS Partnership and Liaison) for facilitating these acquisitions. Dr Paton evidently led an interesting life, being one of the first doctors to enter Belsen concentration camp in 1945. 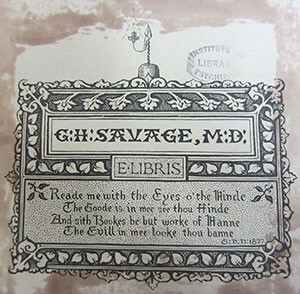 A treatise on the structure, economy, and diseases of the liver by William Saunders. I have recently been helping to co-ordinate academic input to a relatively new project supported by Jisc that is building innovative tools to help with searching and presenting data from the UK Medical Heritage Library (UKMHL) project. The UKMHL, which is supported by the Wellcome Library and Internet Archive, is an ambitious initiative to digitise and provide online access to thousands of books on the themes of medicine and healthcare published during the ‘long’ 19th century (until 1914). 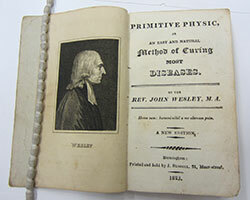 The books are being made available to the public in a rolling programme from the Wellcome and Internet Archive websites. 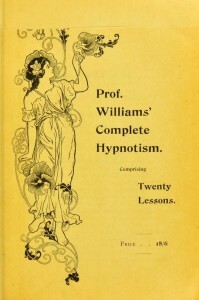 The books are drawn from ten UK research libraries, including King’s College London, and cover a huge variety of subjects including public health and sanitation, infection and epidemiology, nutrition and cookery, the history of disease and its treatment and psychiatry and psychology. Up to 40% of the books were published abroad, notably in the US, Germany and France, and this international dimension provides a fascinating opportunity for comparative study. Ultimately, the UKMHL will provide access to some 15 million pages of OCR text and millions of embedded terms including the names of people, organisations, geographical locations, diseases, treatments and associated data such as medical equipment, and references to contemporary culture and society which will mean the resource is useful not only to medical historians but a much broader range of interested scholars including biographers, geographers and literary experts. The visualisation project, which is led by the Knowledge Integration company in association with Gooii, is developing a range of new data visualisation tools such as graphs, timelines and maps. These will enable established scholars, students and other users such as journalists find what they need quickly from a huge corpus of material, whilst also supporting serendipitous browsing and providing the space in which the user can discover completely unexpected facts and relationships, not least between people, places and ideas. 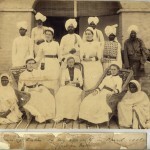 My work involves the design and review of data sets that will help with the selection of presentation of the data, and its contextualisation, and to co-ordinate the contributions of a number of King’s and other medical historians, who are ensuring that the resulting visualisations are both accurate and useful. The new visualisations will be available to use in summer 2016. I started my course in Promotion and Protection of Italian Cultural Heritage Abroad in March 2015. The degree is awarded by the University of Parma through ICoN (Italian Culture on the Net), a consortium of Italian Universities whose mission is the promotion and diffusion of Italian culture and the image of Italy worldwide using distance-learning tools. Classes are held by both academics and professionals from partner institutions, such as the National Cinema Museum of Turin or the Istituto Centrale per il Catalogo Unico. Due to the vocational focus of the program, students are required to carry out an internship, during which they have to design a conservation or promotion project on material or immaterial Italian cultural heritage. I decided to ‘play a home match’, interning at the Foyle Special Collections Library and to work on Italian early printed books. As Italian is not among the languages taught at King’s, I wanted to find a theme that might be of interest to a hefty share of our academic community, beyond linguistic knowledge. While browsing the Maughan bookshelves I stumbled upon Globalization in world history edited by A. G. Hopkins, and decided to develop the theme of archaic globalization. The first step was then to become familiar with the daily work and mission of the Special Collections through induction sessions held by colleagues. After that, I had to identify Italian books on the catalogue and Liz Serebriakoff of Business and Systems Support (and an Aleph expert!) came to my rescue, providing some spreadsheets with records extracted through ARC. Of the hundreds of items detected, roughly 300 were printed before 1700, among which I had to select a subset of books relevant to the theme; after this skimming process I identified almost a dozen of promising items, mainly from the Marsden and Foreign and Commonwealth Office Historical Collections. Having mined for my raw material, I had to decide what to do with it. After consultation with my internship supervisor Adam Ray and the Head of Special Collections Katie Sambrook, we agreed on designing posters using images from selected books, with these to be placed on stands around the Maughan Library. Each poster would carry the bibliographic data of the Special Collections item featured in it, plus the details of an item in the Maughan Library collection on the same subject, therefore creating a link between the two. The posters aim to make the presence of the Foyle Special Collections more visible to students visiting the library and possibly stimulate their curiosity about its holdings. Three posters where produced. The first one showcases the voyages of the Florentine merchant Carletti, who completed a journey around the world in the early seventeenth century. 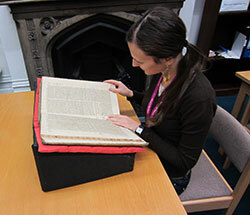 Due to the nature of its binding, digitizing the first printed edition of Carletti’s reports proved to be too risky. We opted to reproduce a map of South America from a beautifully illustrated 1548 Venetian copy of Ptolemy’s Geographia instead. The second poster features the title page of a 1514 surgery treatise by papal physician Giovanni da Vigo, in which he describes the first known outbreak of syphilis in Europe. The last poster focuses on the spread of printing. The chosen image is a detail from a polyglot Psalter printed in Genoa in 1516, showing columns of Arabic and Aramaic text. As we had to find a balance between aesthetics and relevance of the content, many quite interesting items could not be featured in the posters, but might find their space in further projects. I recently gave a paper on Dame Cicely Saunders’s archives at the ‘When is Death?’ conference hosted by the University of Leicester.